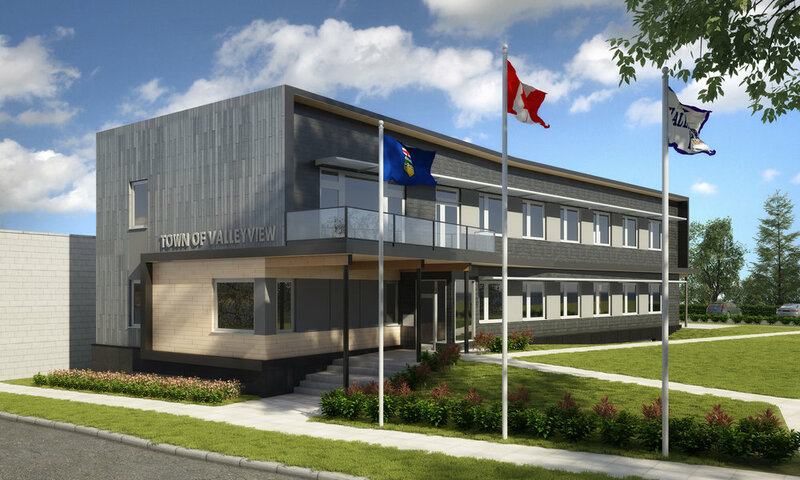 A rendering of the Valleyview Town Hall in Alberta. 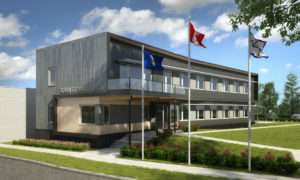 Completed in the late summer of 2018, the Valleyview Town Hall in Alberta is the result of extensive collaboration between the municipality, Flechas Architecture, and Scott Builders to achieve the Passive House Plus standard in a northern climate. This 850-m2 (9149-sf) building aims to become the first commercial building to achieve Passive House certification in Alberta. Guided by fiscal and environmental responsibility, Valleyview’s new town hall was designed to guarantee a long-lasting investment and a 90 per cent reduction in heating and cooling costs, as well as lower carbon emissions. With funding provided by the Alberta government, the town installed 28 kW of solar panels on the building’s rooftop, which not only contribute to operational savings, but also qualified the project to Passive House Plus certification. The Town of Valleyview is located 350 km (217 mi) north of Edmonton. Valleyview has long, cold winters and short, mild summers with temperatures ranging from 22 C (72 F) in the summer, to –20 C (–4 F) in the winter.